Don’t be caught off your professional guard this summer by wearing clothes more suited to the beach, garden or bar than the office ( as I write this, it’s more like autumn, but let’s hold out hope, it’s only the end of July!). The rule is: if you have to think about whether it’s suitable for the office, it probably isn’t. Ask HR if you’re really not sure but use common sense when putting your summer wardrobe together. Good HR departments will have a clear do’s and don’ts dress code policy and good companies should provide air conditioning! Flip flops, bare legs, spaghetti -straps, backless or plunging neckline dresses and tops will destroy your professional credibility. Remember, you’re in the office or work setting to reflect the image of the company, win promotion or a pay rise and promote your professional skills- including your image; save the casual look for home. Summer colours and textures need to be lighter than heavy dark winter suits in order to reflect the warmer weather, so try wearing summer dresses with a bit of structure for a lighter but appropriate summer look that will always work in your favour. 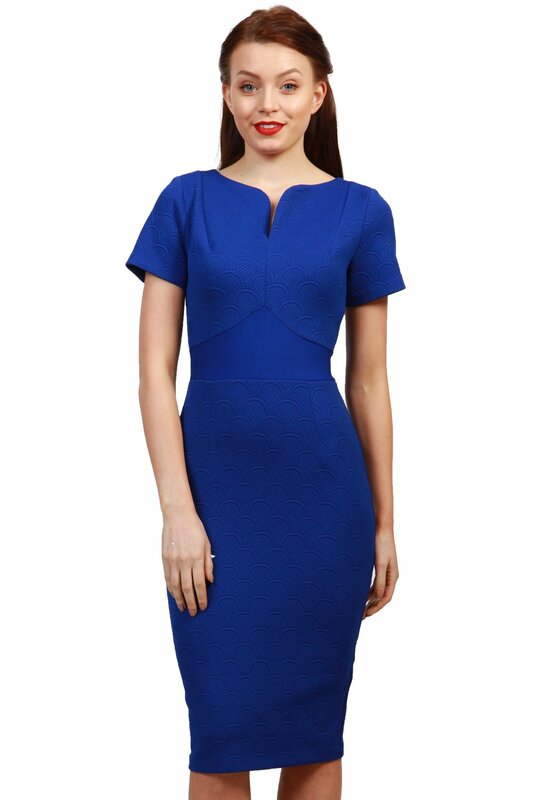 My all time favourite brand is Diva http://www.divacatwalk.com/ – a company with a huge range of structured dresses in a rainbow of colours to suit all skin tones and is totally office suitable. Shown above is their New Ashfield Dress shown in Coral Pink ( perfect for warm skin tone)and Cobalt Blue-shown below (for cool skin tone) . At £115.00 it’s an investment piece which can be dressed up with a light wrap, heels and clutch for occasion dressing or can be combined with a jacket or cardigan for a more client-focused formal office look. I invested in the Cobalt Blue colour and wear it a lot when I give talks and presentations and it always draws compliments and makes me feel totally professional, confident and at ease in business settings. The beauty of the dress is it can be worn all year round but is especially suitable for summer business dressing when worn on its own. In winter, add a heavier textured jacket and thick tights/ boots or dark colour shoes. For summer, wear with neutral coloured tights and shoes to suit your skin tone. Here’s two of TV’s favourite stylish presenters who are hardly ever spotted without their version of the structured dress: Carol Kirkwood, weather girl and Ruth Langsford, presenter. Looking for a wider choice? : try Mary Portas http://www.maryportas.com/and Damsel in a Dress http://www.damselinadress.co.uk/ for equally wonderful brands for professional women. The styles and fabrics have built in curves for straighter ladies and totally flatter those who have plenty of their own. 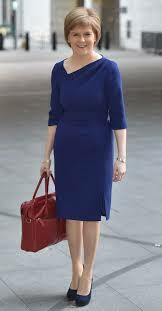 Here’s Nicola Sturgeon looking super professional in her version. Need I say more? Thanks for linking your readers to this article Lizzie.